EpiGentek’s EpiQuik DNMT Activity/Inhibition ELISA Easy Kit is a complete set of optimized buffers and reagents that allows the experimenter to measure DNA methyltransferase activity or inhibition using nuclear extracts or purified enzymes from a broad range of species in a fast and easy manner. 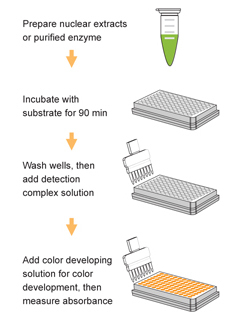 This kit is a further refinement of its predecessor kit by simplifying the steps, significantly decreasing assay time, and increasing assay sensitivity. 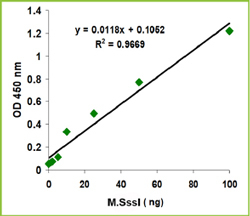 Demonstration of high sensitivity and specificity of DNMT activity/inhibition achieved by using nuclear extracts with the EpiQuik™ DNMT Activity/Inhibition ELISA Easy Kit (Colorimetric). Nuclear extracts were prepared from Hela cell line. 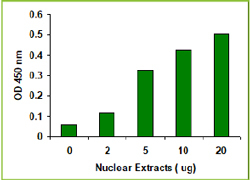 Demonstration of high sensitivity and specificity of DNMT activity/inhibition achieved by using nuclear extracts with the EpiQuik™ DNMT Activity/Inhibition ELISA Easy Kit (Colorimetric).